The Chancellor of Austria (German: Bundeskanzler der Republik Österreich, lit. 'Federal Chancellor of the Republic of Austria') is the head of government of the Austrian Republic. The chancellor chairs and leads the government, which is composed of him, the vice-chancellor and the ministers. Together with the president, who is head of state, the government forms the country's executive leadership. Austria is a parliamentary republic, the system of government in which real power is vested in the head of government. However, in Austria most executive actions of great extent can only be exercised by the president, upon advice or with the countersignature of the chancellor. Therefore the chancellor often requires the president's assent to implement greater decisions. Furthermore neither the ministers nor the vice-chancellor report to the chancellor. In legislature, the chancellor's power depends on the size of his affiliated parliamentary group. In case of a coalition government, the chancellor commonly is the leader of the party most represented in the National Council, with the leader of the party able to grant a majority, usually serving as the vice-chancellor. The first Austrian sovereign head of government was the State Chancellor of the Austrian Empire, a position only held by Klemens von Metternich. The office was later renamed to Minister-President of the Austrian Empire and remained from there on until the dissolution of Austria-Hungary. The first head of government after the monarchy was the State Chancellor of German-Austria, an office again only held by one person; Karl Renner. After allied powers declined a union between Austria and Germany, the office was renamed to just State Chancellor of Austria and later changed to Federal Chancellor, which remained the position's final form until present day. The official residence and executive office of the chancellor is the chancellery, which is located at the Ballhausplatz in the center of Vienna. Both, the chancellor as well as the government are appointed by the president and can be dismissed by the president. 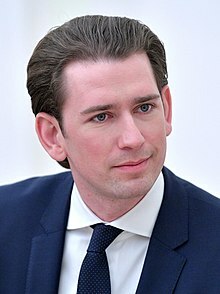 The current officeholder is Sebastian Kurz, who was sworn in on 18 December 2017 by President Alexander Van der Bellen. The use of the term Chancellor (Kanzler, derived from Latin: cancellarius) as head of the chancery writing office can be traced back as far as the ninth century, when under King Louis the German the office of the Archchancellor (Erzkanzler), later Imperial Chancellor (Reichserzkanzler), was created as a high office on the service of the Holy Roman Emperor. The task was usually fulfilled by the Prince-Archbishops of Mainz as Archchancellors of the German lands. In the course of the Imperial reform, the Habsburg Emperor Maximilian I in 1498 attempted to counter the spiritual power of the Reichserzkanzler with a more secular position of an Imperial Court Chancellor (Hofkanzler), but the two became merged. These were also the times when attempts were made to balance Imperial absolutism by the creation of Imperial Governments (Reichsregiment), ultimately a failure. Nevertheless, when Maximilian's grandson Ferdinand I succeeded him as Archduke of Austria in 1521, his elder brother Emperor Charles V (1519–1556) appointed Mercurino Gattinara as "Grand Chancellor of all the realms and kingdoms of the king" (Großkanzler aller Länder und Königreiche). The separate position of an Austrian Court Chancellor appeared as a Österreichische Hofkanzlei around 1526, when the Habsburg Monarchy arose with the Bohemian and Hungarian inheritance; it was however once again merged with the equivalent Reichshofkanzlei office of the Holy Roman Empire in 1559. Upon the 1620 Battle of White Mountain and the suppression of the Bohemian revolt, Emperor Ferdinand II had separate Court Chancelleries established in order to strengthen the unity of the Habsburg hereditary lands. Beside a Bohemian and Hungarian chancellery, he created the office of an Austrian chancellor in Vienna, responsible for the Archduchy of Austria proper (i.e. Upper and Lower Austria) with the Inner Austrian territories and Tyrol. Under Emperor Leopold I (1658–1705) the term again became Hofkanzler with Johann Paul Freiherr von Hocher (1667–1683), and Theodor von Strattman (1683–1693). The eighteenth century was dominated by Prince Wenzel Anton of Kaunitz-Rietberg (1753–1792), who was Chancellor to four Habsburg emperors from Maria Theresa to Francis II, with the titles of both Hofkanzler and Staatskanzler. He was succeeded by Johann Philipp von Cobenzl (1792–1793), who was dismissed by Emperor Francis II over the Partition of Poland and was succeeded by Johann Amadeus Francis de Paula (Baron Thugot) (1793–1800). Thugot's chancellorship did not survive the Austrian defeats by the French at the battles of Marengo and Hohenlinden in 1800 and he was replaced by Johan Ludwig Joseph Cobenzl (1800–1805), his predecessor's cousin, but who in turn was dismissed following the Austrian defeat at Austerlitz in 1805. With the consequent dissolution of the Holy Roman Empire and founding of the Austrian Empire, Francis II abdicated the former Imperial Throne, but remained Emperor Francis I of Austria in 1806. He had replaced Cobenzl with Johan Philip Charles Stadion (1805–1809) the previous year, but his career was in turn cut short in 1809 following yet another Austrian defeat by Napoleon at the Battle of Wagram and subsequent humiliation at the Treaty of Schönbrunn. Prince Klemens von Metternich was appointed by Francis I to the positions of Hofkanzler and Staatskanzler (1821–1848). However, there is some opinion that the Chancellor title was not used between Prince Kaunitz-Rietberg's resignation in 1792 and 1821. As the Metternich system had become a synonym for his reactionary politics, the title of a State Chancellor was abolished upon the 1848 revolutions. The position became that of a Minister-President of Austria, equivalent to Prime Minister, with the exception of Count Friedrich Ferdinand von Beust (1867–1871) the title only re-emerging at the birth of German Austria after World War I in 1918, when Karl Renner was appointed Staatskanzler. With the enactment of the Constitution of Austria on 10 November 1920, the actual term Bundeskanzler was implemented as head of the executive branch of the First Austrian Republic. The Chancellor is appointed and sworn in by the President. In theory, the President can appoint anyone eligible to be elected to the National Council, essentially meaning any Austrian national over the age of 18. In practice, a Chancellor is unable to govern unless he or she commands the confidence of the National Council. For this reason, the Chancellor usually is the leader of the largest party in the National Council, or the senior partner in a coalition government. A notable exception to this occurred after the 1999 election. The Freedom Party won the most seats and went into coalition with the People's Party. While this would have normally made Freedom Party leader Jorg Haider Chancellor, he was deemed too controversial to be a member of the Cabinet, let alone Chancellor. He thus stepped aside in favour of People's Party leader Wolfgang Schüssel. The Chancellor has no term limits. As a matter of constitutional convention, the Chancellor usually offers his or her resignation to the President upon dissolution of the National Council. The President usually declines and directs the Chancellor and his or her cabinet to operate as a caretaker government until a new National Council is in session and a new majority leader has emerged. In fact, the constitution expressly encourages the President to use a Chancellor as his or her own interim successor. A Chancellor is typically appointed or dismissed together with his or her ministers, which means the whole government. Technically, the President can only appoint ministers on advice of the Chancellor, so the Chancellor is appointed first. Having been sworn in, the Chancellor presents the President with his or her list of ministers; they will usually have been installed just minutes later. Neither Chancellors nor ministers need to be confirmed by either house of parliament; the appointees are fully capable of discharging the functions of their respective offices immediately after having been sworn in. The National Council can force the President to dismiss a Chancellor or a minister through a vote of no confidence. The President is constitutionally required to dismiss a cabinet member the National Council declares it wants gone. Opposition parties will sometimes table votes of no confidence against ministers, and occasionally whole cabinets, in order to demonstrate criticism; these votes are not expected to pass and never do. Ministers Council room in the Federal Chancellery. The Chancellor chairs the meetings of the cabinet. The constitution does not vest the Chancellor with the authority to issue directions to ministers; it characterizes his or her role in the cabinet as that of a primus inter pares. The power of the office to set policy derives partly from its inherent prestige, partly from the fact that the President is required to dismiss ministers the Chancellor requests removed, and partly from the Chancellor's position of leadership in the party or coalition controlling the National Council. notifies provincial governments of bills passed by the National Council that require their assent to become law. The Chancellor also convenes the Federal Assembly if the National Council moves to have the President removed from office, or if the National Council moves to lift the immunity of the President from criminal prosecution. In the former case, the Federal Assembly votes on whether to allow a referendum on the matter. In the latter case, the assent of the Federal Assembly is required for the President's immunity to be rescinded. Finally, the Chancellor becomes Acting President if the President is incapacitated. However, if the President remains incapacitated after twenty days, the role of Acting President is passed to the three Presidents of the National Council. ^ "Interdisziplinärer Arbeitskreis Kurmainz und der Erzkanzler des Reiches: Reichserzkanzler". ^ a b Cambridge Modern History vol xiii 1911. Books.google.ca. Retrieved 20 September 2012. ^ "Austria Forum Web Books Viewer". Wikimedia Commons has media related to Chancellor of Austria.